If you’re looking for something to remove impurities, unclog pores and help with your oily skin, barberry bark is your answer. Used in traditional medicine for thousands of years, it contains a number of natural components that help soothe and work for those with too much oil. Used for thousands of years, barberry can help with your oily skin. 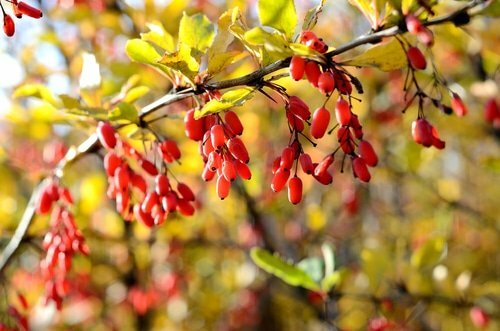 Known scientifically as Berberis Vulgaris, barberry is also called Chinese Goldthread, European barberry, holy thorn, and pepperidge bush. A thorny shrub that can grow to about 9 feet tall, it has small, colorful flowers, and likes to grow along the edge of fields or forests, though it’s often cultivated as a hedge in parks and gardens. Toothed leaves manage only about 4 inches in growth. Small red fruits ripen in the fall, and are considered more sour, but less bitter than cranberries. Barbery was mentioned in traditional Chinese medicine as far back as 3,000 years ago, and even shows up in ancient Egyptian texts. In Italy, the barberry is called the “holy thorn” because legend states it was used in Jesus’ Crown of Thorns. Traditionally, barberry was used to treat stomach ailments, improve appetite, reduce fever, and promote a sense of vitality and well being. It also has a long reputation of combating infections and bacteria, and for stimulating the immune system. Other traditional uses include treatment of respiratory problems, yeast infections, and tuberculosis. Today, the University of Maryland Medical Center states that barberry is used to ease urinary tract infections, diarrhea, respiratory tract infections, sore throat, and gastrointestinal infections. Barberry compresses are even recommended for treating conjunctivitis or inflamed eyelids. Considered a “bitter tonic,” barberry can also help in detox efforts, cleaning the system and supporting liver function. This action, along with barberry’s ability to expand blood vessels and stimulate circulation, has also given barberry a reputation as the perfect remedy for a hangover. Barberry contains a component known as “berberine,” which is cleansing. This makes this ingredient perfect for helping to unclog pores and tame oily skin. Barberry is also a good source of vitamin C, which is great for protecting the skin environmental stressors. Barberry can help to firm and tighten the look of your skin with repeated use. If you want to try barberry for yourself, we’ve included it in our Herbal Facial Oil for Oily Skin. Makes sense, with barberry’s oily skin fighting powers, right? Let us know what you think. How else do you use barberry? Please share your tips. Reuter, Juliane, Merfort, Irmgard and Schempp, Christoph M. Am J Clin Dermatol. 11(4): Botanicals in Dermatology: An Evidence-Based Review. Medscape Today. [Online] 2010. [Cited: January 18, 2011.] http://www.medscape.com/viewarticle/723144_2. Therapeutic Research Faculty. Oregon Grape (Barberry) Full Monograph. Natural Medicines Comprehensive Database. [Online] 2011. [Cited: January 22, 2011.] http://naturaldatabase.therapeuticresearch.com/nd/Search.aspx?